From a Society point of view, the event was OK - its a good opportunity to keep up with the competition players, and show them what SoA is up to. 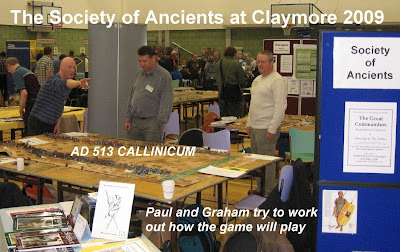 But there is little in the way of visitor interest - so my thanks go to the stalwarts of the Lance and Longbow Soc, Steve and Dave, and to Alison on the door, all of whom helped out while the usual suspects were away playing games. So an enjoyable but tiring weekend at the Condottieri coalface. 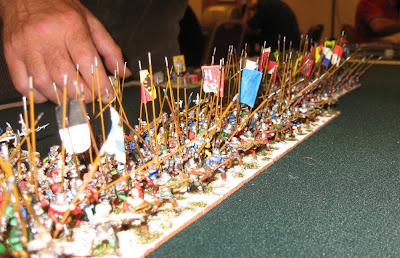 As well as one of the other Italians, I played an Ottoman, 2 Catalans (one of which was Karsten from the FoG group - nice to meet you, Karsten) a Swiss and a Later Crusader. It was a great game against Kevin's Swiss, and I managed to scrape a win in that one. It is a sign that the mainstream game has moved since DBM 3.1 ... you now can get both a good game and a win against Swiss with Italians (that said, the results page speaks for itself ...). 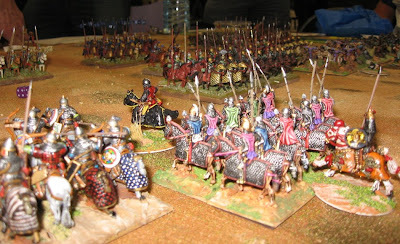 Pete Dalby won the Medieval FoG with his Ottomans, Phil Powell won out over the Dom Rom Swarms in the ancient period (relentless use of tactics throughout the event - read more on the forums and mail groups ...), with, elsewhere, Richard Collins taking the 25mm, Mike Bennett the DBMM and Jez Evans the DBM. 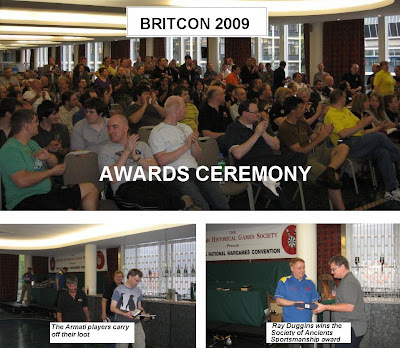 The new venue comprised 2 main areas, the hub area at the front of house, and the gym hall a corridor’s length away. We were in the Gym. It always feels a bit cut off to be in the ‘other’ room, but I got the feeling everyone got round, and there was enough trader and game content to make the gym an essential part of the tour. 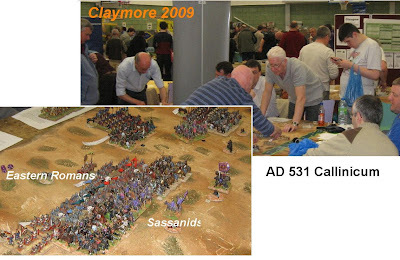 Deliberate or not, there was very much an Ancients theme to our area, as well as the Callinicum game Glasgow Phoenix were putting on for us, Gateshead club had an adjacent game, Lance & Longbow presented an impressive ‘Fulford Gate’ (stretching the concept of Lance & Longbow, maybe, Dave? 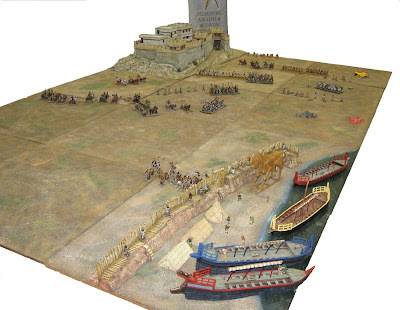 … ), and there was a visual very impressive Siege of Troy layout. I would like to thank Paul Innes and his Glasgow crew for putting on Callinicum. 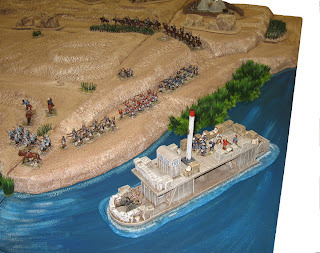 As some of you may be aware from the pre-publicity, this was a transportable version of the big 25mm sand table game put on for the Scottish participation in this year’s Battleday. Having joined in the Bletchley proceedings, I was keen to see another version, and already well-briefed on the battle. 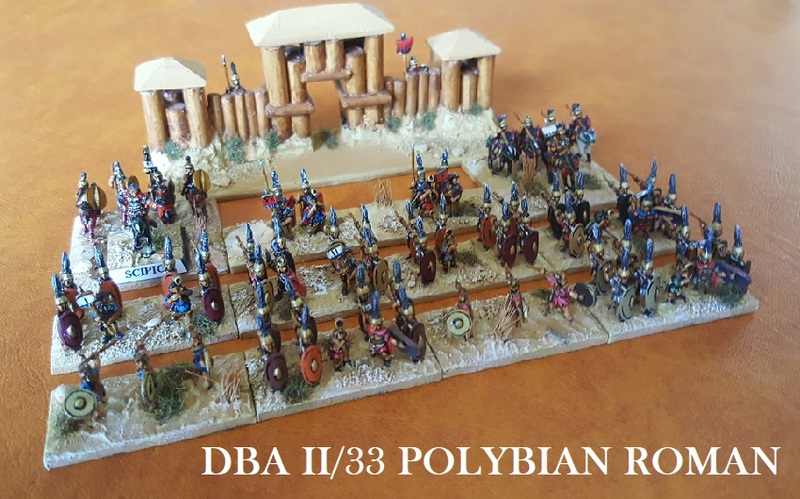 As a fan of Arty Conliffe wargames (as well as being an Armati regular, I have been impressed with what I have seen of Shako and of Crossfire …) … I was keen to have a look at the proposed mechanics of Tactica II. 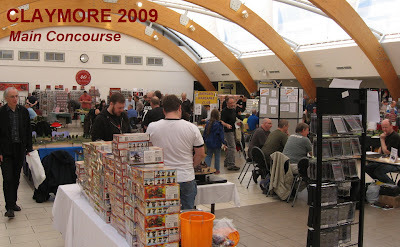 Paul was careful to ensure that the game and info sheets gave a good flavour of the battle and of Tactica’s ideas without giving the unpublished new game away, and I shall respect his concerns. In addition, some of the game mechanisms were scenario add-ins to simulate the historical context. 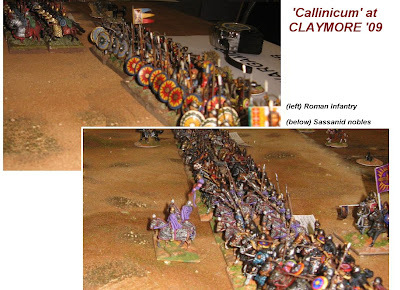 The game runs to an initiative driven IGO-UGO sequence, with limited manoeuvre, simultaneous shooting but player-defined melee directions: familiar stuff to Armati/Tactica enthusiasts, but with some new subtle tweaks. A feature that certainly seemed to work well was variable unit size, and break levels gear to a link of unit size and morale/training levels. Again, not to much I will say, and no judgements I would like to make after what was just a taster … however it did seem to mesh nicely and gave a good and entertaining picture of battle. 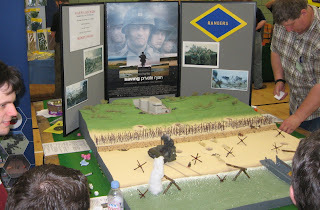 The scenario played quickly despite a large number of players and visitors joining in, and the games were quite tight … comfortably allowing a morning and an afternoon run to completion, and a 1:1 result overall – which reflects both a balanced game, I think, and how marginal (or mostly ‘spun’) was the historically claimed ‘victory’. add too much to the above brief survey of what seemed to be a successful show. Thanks very much to everyone who contributed and to everyone who stopped by (and thanks for the positive feed back). Thanks to SESWC for inviting us, and I hope the new venue lived up to your expectations.